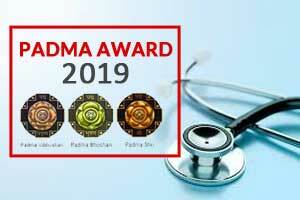 New Delhi – Fourteen doctors ( inclduing one-duo) have been conferred Padma Shri awards for their contribution to the field of medicne and healthcare as well as one doctor have been honoured with a Padma Bhushan for his contribution to Indian Healthcare. The awards are announced on the occasion of Republic Day every year. Padma Awards – one of the highest civilian Awards of the country, are conferred in three categories, namely, Padma Vibhushan, Padma Bhushan and Padma Shri. The Awards are given in various disciplines/ fields of activities, viz.- art, social work, public affairs, science and engineering, trade and industry, medicine, literature and education, sports, civil service, etc. ‘Padma Vibhushan’ is awarded for exceptional and distinguished service; ‘Padma Bhushan’ for distinguished service of high order and ‘Padma Shri’ for distinguished service in any field. Feel proud of them. Congratulations.